Such is the popularity of TechSoft’s 2D Design that everybody in schools knows what it is don’t they? 2D Design has become a mainstay of the UK’s Design & Technology curriculum. Students (and their teachers) inundate our Facebook and Twitter with examples of high quality work they have done. With the publication of the new Design & Technology curriculum drawing close, 2D Design will be more important than ever in helping to implement a robust, technical and numeracy based platform for creativity in the subject. 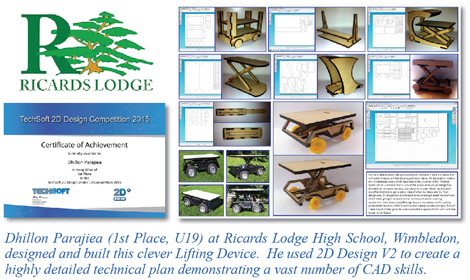 TechSoft were delighted with the response we got for calls to our 2D Design UK Schools competition 2015. The entrants impressed the judges, and displayed some outstanding CAD work that detailed just how technically adept our young UK designers are. And so the winner is.............(an X-Factor long pause)......................Dhillon Parajiea of Ricards Lodge High School, Wimbledon - who came top of the Under 19 competition with his ‘Lifting Device’. A detailed technical plan, showcasing a multitude of 2D CAD skills from contouring, to tangents, arrays and layout planning. 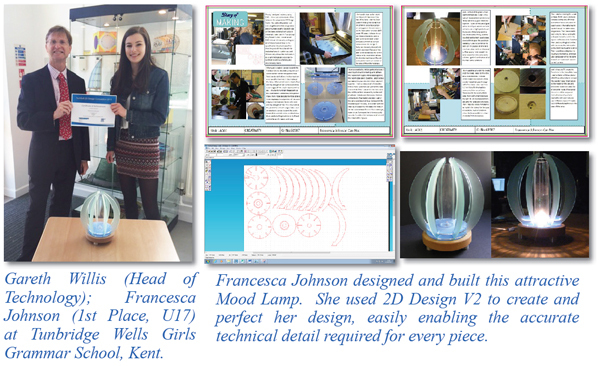 The Under 17 crown was taken by Francesca Johnson of Tunbridge Wells Girls’ Grammar School, who designed and manufactured a ‘mood lamp’. 2D Design was used to perfect the beams around her design, with technically detailed arrays, copies and arcs pinpointing every detail over her CAD design. No prizes here, but special mentions go to the following Highly Commended Under 19 student entries. Naomi Zade of Streatham and Clapham School used 2D Design to produce her own fabric print; Xavier Tang of Queen Mary’s Grammar Walsall used 2D Design’s range of arc options to create an aesthetically pleasing letterbox. The Under 17 Highly Commended student entries included two more from Tunbridge Wells Girls’ Grammar School - Francesca Stevens designed an intricate ‘slot together lamp’ impressing the judges with her use of contours, and mathematical geometry in slotting together various shapes all in one piece; Megan Brown narrowly missing out with her mood light showcasing vector and rastering ability in 2D Design. Other U17 Highly Commended entrants were David Pearce from Queen Mary’s Grammar School with an outstanding demonstration and understanding of cutting management. Usaamah Ahmed kept the Queen Mary’s flag flying with his neat and tidy clock design. Matthew Sayer of Fulford School showed detailed planning using 2D Design, with Freddie Wannop from the same school equally showing his layout planning skills. Finally a selection of ingenious bedside lamps designed by Clara Benavides, Jessica Warne and Louisa Pinkney from Streatham and Clapham School also impressed our judges. A special mention should go to our youngest ever entrant, Emily Sneesby of Fulford School who at aged 12 produced a ‘Bunny Rabbit Autometa’. Her 2D Design skills already show that she has the talent to be winning the competition by the time she sits her GCSE in Design & Technology. Well done to all the teachers and students involved. It has been such a pleasure looking through your designs and the work presented to us! More and more students are using 2D Design or 2D Primary to gain the skills that the design and engineering industry wants. Coupled with the output possibilities of TechSoft machines such as lasers, millers/routers, plasma cutters, embroidery machines, knife cutters and print and cut devices - you can safely say that Design & Technology is here to stay, and the young designers of the future will ensure that it remains as one of the curriculum’s most important subjects for STEM, innovation and creativity.